The soy based formula is designed to moisturize and penetrate nails for an ultra hydrating experience. 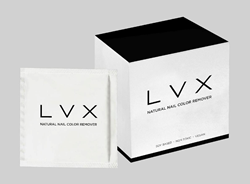 Luxury nail lacquer brand LVX, launches Natural Nail Color Remover pads that are 100% plant based and biodegradable. The brand sought to create a healthy solution to the harsh and toxic acetone formulas on the market. This innovative formula has a unique blend of ingredients that nourishes and strengthens nails and cuticles. One pre-moistened wipe will remove color from all fingers and toes. The remover contains essential Vitamins A, C, & E and pure jojoba oil. The 12 pre-moistened wipe pack will retail for $20. Launching April 24th, 2016 exclusively on http://www.shoplvx.com and at participating retailers. The long lasting, chip resistant and non-streak lacquer formula is free of harsh and toxic chemicals. LVX products are VEGAN and formulated without the use of Formaldehyde, Formaldehyde Resin, DBP, Toluene, Camphor, Xylene and Parabens. LVX nail lacquer is 7 Toxin free, cruelty-free and TPHP free. All products are produced in the U.S.A.